Dozens of people donning orange shirts gathered at the residential school commemorative sculpture outside the Tseshaht Longhouse on Sept. 28 to honour survivors, remember the ones that have since passed on and the ones that didn’t make it home. Hosted by the Nuu-chah-nulth Tribal Council’s Teechuktl/Quu’asa team, Orange Shirt Day featured a walk to raise awareness of the harm done by Canada’s Indian residential schools. Sept. 30 has been declared Orange Shirt Day annually, in recognition of the harm the residential school system did to children’s sense of well-being and self-esteem - and as an affirmation of our commitment to ensure that everyone around us matters. His^uuk %asma t~aatnaa %aq qin (we are all children), was the theme for the event, which started in the parking lot in front of the Tseshaht Longhouse next to the Residential School Memorial Sculpture. 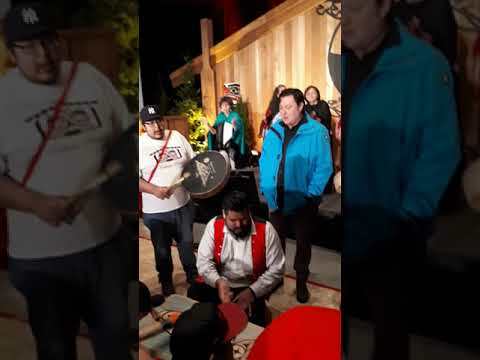 Residential school survivors and their supporters were joined by special guests, a delegation of Gitxsan people who travelled for two days to take care of some important healing business. They were there to remember their people that attended Alberni Indian Residential School, and, more importantly, to do necessary cultural work of reclaiming their spirits. The Gitxsan delegation walked up to the school along a route that they hadn’t seen since they were children; some up to fifty years ago. Dressed in red regalia, they retraced their childhood steps from a small park on River Road up to the grounds where AIRS once stood, arriving at a gate behind Connie Watt’s beautiful Thunderbird sculpture. Orange Shirt day is normally held on Sept. 30 but since that day falls on a Sunday, staff at Quu’asa observed it on the Friday before. They chose a theme of ‘Strength from Within’ and walked with their Gitxsan guests up to area now known as NTC or Maht Mahs. Students from Haahuupayak School treated their guests to lively singing and dancing as they showed love, respect and more importantly a love for their culture and language, which they continue to learn. Cultural Education teacher Trevor Little pointed out that one of the songs that the children sang talks about becoming stronger and was created by George Watts. Port Alberni Councillor Shari Minions was there representing the city’s Reconciliation Committee. She said she was born and raised in Port Alberni and never knew about Alberni Indian Residential School until she went to college. She noted that events such as this one are important for healing and for learning from the past. Gitxsan Chief Larry Marsden thanked the local chiefs and matriarchs for welcoming his people there, a place where many Gitxsan children were taken to attend Alberni Indian Residential School. “A lot of survivors that came to school here lost their spirits; we come here today to take our spirits back,” said Chief Marsden. He said it was important to do this healing work so that their survivors can live a longer life. Indian Residential School support worker Wanda Good said 20 people came from Gitxsan territory – the ones that were strong enough to do the healing work. “It is a Gitxsan belief that where somebody falls, there is trauma, and some [who] are here today heal,” she said. Good went on to say that the Gitxsan survivors that were there would be calling back the spirits of loved ones and would also stand there for the ones back at home that were not strong enough to make the trip. “They will shake off that (negative) energy and leave it forever,” she said. Representatives from Quu’asa and Tseshaht presented gifts and jewelry to their Gitxsan guests. “Tseshaht thanks you so much for doing your work here, for doing your healing work in our home; we are happy that you’re here to ‘take the kids back home” said Lisa Watts, Quu’asa worker. “We recognize and acknowledge there was pain and you took our power back,” Watts said. “We want you to know that we see you, we see your beautiful spirits,” she added. Chief Marsden said he enjoyed the kids’ cultural performances. “I can see we have a strong, bright future,” he added. The Gitxsan people, with support of Quu’asa staff, retreated to the site where Peake Hall once stood and began their emotional cultural healing ceremony in private. Tseshaht Councillor Richard Watts welcomes the Gitxsan members to his First Nation’s territory. Donna Samuel, who grew up Gitxsan before marrying into an Ahousaht family, speaks in her ancestral language outside the Tseshaht Longhouse.